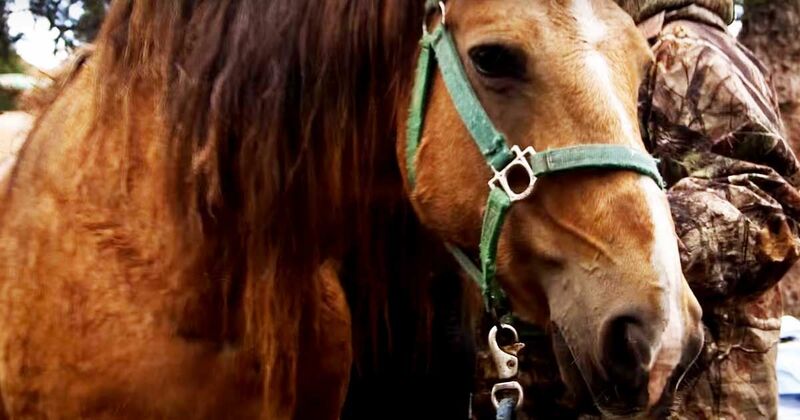 Sometimes horses find themselves in precarious positions, desperately in need of human help. That's what happened to Lucky, a pack horse, when he lost his footing while crossing a river in Alaska. Lucky was beaten up badly by the river's rocks, and his legs were so swollen and painful that he couldn't walk. He was also hours from the nearest clinic, so rescuers needed a way to get him out quickly. Enter a special sling and a helicopter. Lucky was harnessed up and gently lifted into the air, then transported to a clinic where his injuries could be better assessed and treated. The video below captures the incredible moment when Lucky is flown high above the ground. Large animal rescue, particularly when working with horses, can be a dangerous and challenging endeavor. Not only are rescuers working with animals which weigh more than 1,000 pounds, but they're working with horses which are often frightened, in pain, and reactive. A kick from a horse can injure or kill a person, so prioritizing rescuer safety is always important. According to the Large Animal Rescue Company, experience and training can help to improve the safety of a large animal rescue. A veterinarian on site is often able to sedate a horse to help keep it calm, making the rescue safer for everyone involved. A bit of creativity comes into play, since every situation is unique, and being able to think ahead and envision the "what ifs" is a vital skill for any rescuer. Sometimes rescuers face situations where a horse is pinned or trapped, making it difficult to move him. Rescuers use a variety of equipment, including slings, lifts, pullies, and more. Just like the sling was adjusted and altered to suit Lucky in this video, it's important for rescuers to choose the right type of equipment suitable for the situation. When you think about it, humans are able to pull off some incredible horse rescues. Anyone participating in a horse rescue is taking a risk, but often those risks pay off with the reward of a rescued horse who is returned to safety once again.